Some spins can positively perplex. The same Al Jazeera revelations which threw the cardboard regime of PA figurehead Mahmoud Abbas into a total tizzy, instilled boundless joy in the hearts of Israel’s indomitable Left. Leaks attributing to Abbas a hypothetical inclination to perhaps consider a morsel of a crumb of compromise have served to seriously undermine Ramallah’s Fatah honchos on their own turf, paint them as traitors to the cause of eliminating Israel and elicit from them a panicky flurry of vehement denials. This, in the eyes of our diehard proponents of an accord with the same said Abbas, is a highly encouraging development. This, aver they, proves yet again that Abbas is a promising and reliable interlocutor, that he is an earnest, well-intentioned peace partner, willing to relinquish scraps of territory to intransigent Israel. We could interject at this point and note that Abbas can hardly be said to be ceding what he doesn’t possess and that it’s Israel which possesses what Abbas is so ecstatically extolled for magnanimously “giving up,” should Israel acquiesce to mass suicide. But we won’t pettily harp on fundamentals. Instead, let’s follow the Abbas fan club’s circuitous calculations to their logical end. Thus, many tortuous convolutions later, we’re right back where we started: 2+2 = 2+2. THE SEARCH for creative solutions would inescapably land us back on that precarious June 4, 1967 square one. Jerusalem would revert to its divided, dangerous and dead-end condition of yore. Our holiest sites would become inaccessible. We’d be beamed back to when Kfar Saba and Petah Tikva were unsafe border towns. We’d nostalgically recall the Six Day War when all that hit Kikar Masaryk in the heart of Tel Aviv were shells from a Jordanian World War II-vintage Long Tom cannon. Contemporary improved projectiles obviously include ballistic missiles. But aside from bloodcurdling firepower upgrades, the bottom line stays identical, proving essentially that 2+2 indeed equals 2+2. To get our mediocre heads around all the above we’d have to rise to the peacenik moral-high ground, whose atmosphere of rarefied sophistication reputedly highlights subtle differentiations. By bedecking with the banner of peace all territorial giveaways which facilitate our ultimate extinction, we’d derive much cerebral satisfaction from our sacrifices. This is the compelling calculation which guided the superior intellects who lured us to Oslo, Camp David, Taba, Annapolis and other venues of equally useless mediation. Their assumption throughout was that our purported peace partners and the international community would be wowed by the greatest folly ever squeezed from any sovereign state and would bestow upon us an exemplary conduct commendation. It’s here, though, that the sums don’t quite add up. Nevertheless, our indefatigable mathematicians can be counted upon not to own up to any slipups. The last thing they’d admit is that their equation lacks the unabated Arab-hatred factor. Assiduously refusing to recognize it, they couldn’t concede that Abbas, like Yasser Arafat before him, might not relish going down in history as the one who agreed to formally end hostilities while the Jewish state still tauntingly exists. That, of course, is why even Ehud Olmert’s egregiously outlandish offer was a nonstarter for Abbas. All negotiations are pretty much bound to flop. Abbas cannot pull his own public toward accommodation. It’s not a matter of conciliatory forces overcoming fanatics. Since 1920, the Arab street is consistently controlled by an inexorable self-destruct mechanism coercing it to follow the most extreme available option. Perceived moderates are cravenly defensive and are neutralized to no small measure by their own machinations. They themselves fan the flames of zealotry. Rather than dispute radical narratives, they echo them as means to winning popularity. All libel and demonize Israel. To the extent that variant views exist, they are only cosmetic and superficial. The debate is make-believe, not about substance but about which anti-Israel tactics are preferable. Entirely missing from the Palestinian scene is a peace camp, one which need not embrace Israel – as some Israelis do the Palestinians – but a party which thoroughly reevaluates the regression, damage and suffering that Palestinian-instigated violence had over the generations inflicted upon Palestinian society itself. Such sobering reassessment is primarily the Palestinian interest – for their own sake and not for the love of us. Sadly, however, it appears that the taboo on sincere reconciliation with Israel – as a Jewish state with a moral right to continue existing in this region – is too powerful for any aspiring Palestinian politician to break. Not a word is heard across the Green Line about genuine unequivocal acceptance of Israel. At most there is reluctant readiness for a limited truce as long as Israel basically capitulates to every last Arab precondition. By omitting this from their computations, dovish number-jugglers do worse than go in circles. They falsify the results. In effect, they tell us that 2+2=22. We can only hope that regular folks won’t be befuddled by too many square roots, fractions and figures which whirl on the fantastical peace merry-go-round. 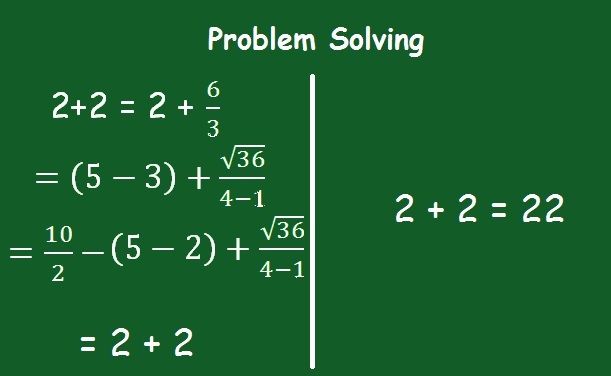 You don’t need to be genius to work out that 2+2 = 2+2 and that 2+2 isn’t 22. Our straightforward common sense leads us to extend two fingers from one hand, next to two from the other and then we count a total of – golly gee – four! 2+2 = 2 States – Jordan and Israel – negotiating a 2 state solution by allocating sovereignty in the West Bank between their respective states thereby completing the allocation of 99% of the land contained in the Mandate for Palestine between Arabs and Jews – approximately 80% to the Arabs and 19% to the Jews. An Einstein inspired equation will be needed to deal with the allocation of sovereignty of the remaining 1% (Gaza). In my days 99/100 was a pretty good result anyway. Today’s headlines hit hard against Israel’s fauxpeace camp turned psychotic campers bereft of any common sense. They’ve been robbed and don’t even know it. They no longer live in the real world,they have escaped from reality and it is not possible to reason with these mentally disturbed and derranged suicidal nuts. If they are not stopped they will to take the whole country down with them. Gaza didn’t even move them a millimeter back to reason. Many years ago I came out and stated that peace between Israel and Islam was impossible.The majority having imbibed the snake oil of the pimps of no peace didn’t want to hear the truth because the lies sounded sweeter. Tunisia,Egypt,Jordan and Yemen make it clear that the 2 state solution adds up to another Shoah for Israel. So why does Israel continue with the Pogrom ?